No one wants to be bugged while they're at the beach, either from hawkers or from actual bugs. Among biting pests, mosquitoes get most of the attention at the beach, and rightly so: These flying bloodsuckers can spread some nasty diseases, from Dengue fever to malaria to the Zika virus. Preventing mosquito bites is crucial if you want to have a healthy and happy beach vacation. But in terms of sheer irritation, sand flea bites may be even worse than mosquito bites. Fortunately, the prevention tips for both types of pest attacks are pretty similar. Sand fleas are known by several names, including sand flies, beach fleas, sand gnats, hop-a-longs, punkies, or the very appropriate "no-see-um," given their tiny size. In fact, there are a number of biting shoreline bugs that get lumped into the category of sand fleas—some are biting midges while others are tiny, jumping crustaceans. They can be found on warm-weather beaches all over the world. Sand flea bites on humans are normally found in clusters around the ankles, arms, and back. Sitting or laying on a beach makes you a prime target because these buggers don't ever fly or jump higher than a few feet off the ground. Despite the sand flea's small size, the bite from one can cause a large welt or rash that can persist for days. Welts or hives produced from the bites are itchy and painful, but scratching bitten areas should be avoided, as irritating the skin will prolong the symptoms, and open wounds caused by scratching can become infected. Wear DEET insect repellent and reapply regularly throughout the day, especially on high-target areas like feet and ankles. Avoid the beach in the early morning, at dusk, or when there is cloud cover and the beach is cooler, since that’s when sand fleas tend to come out the most. Windy days are better beach days for avoiding sand fleas since they aren't strong fliers. Stay off the beach right after the rain, as the cooler, wetter conditions encourage sand flea activity. Head to the beach later in the morning or in the early afternoon, when sand fleas are less active. If you're on the beach at prime sand-flea hours, keep moving: They're not very fast but will swarm you if you linger too long. Avoid laying or sitting directly on the sand: a lounge chair or a blanket is ideal. Cover your feet, ankles, and calves whenever possible. Keep windows and doors shut at night if you're staying near the beach—sand fleas can sometimes fit through screens. If you do get bitten, there are a few steps you can take to sooth the irritation. 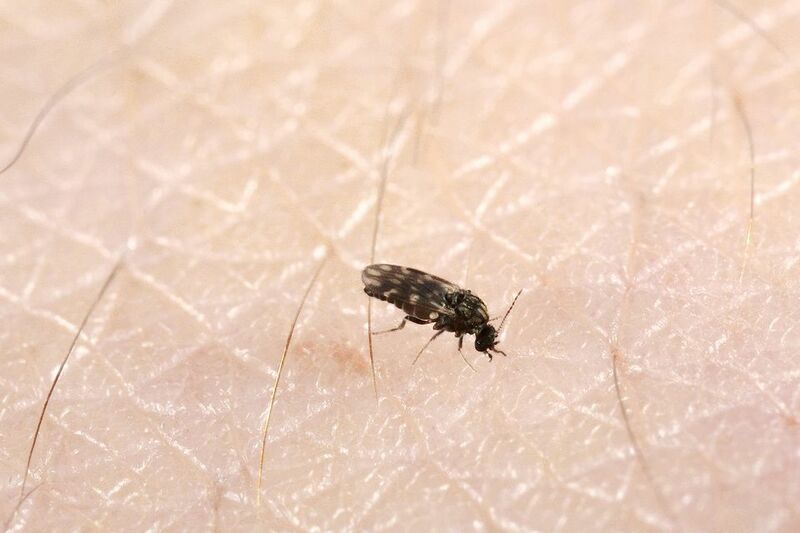 Much like with other minor bug bites, sand flea bites can be treated with calamine or hydrocortisone cream, ice compresses, a colloidal oatmeal bath, or aloe vera. Antihistamines can help ease itching, and ibuprofen can alleviate pain. Whenever you travel to a beach destination, carry some of these remedies with you.